Sampled Jerry Jones Electric Sitar built into an atmospheric synth engine. HG Electric Sitar is based on a multi-sampled Jerry Jones Electric Sitar, the modern day equivalent of the 60?s Dan Electro, used by the Beatles and the Stones. There are 7 different sample sets, each containing at least 4 octaves of samples, one for each note. Any two sample sets can be used simultaneously to give plenty of flexibility for creating interesting Sitar based sounds and atmospheres. The plugin is based on the HG Piano, and so also includes soundscaper, an effect capable of combs, delays and reverbs which is very good for producing experimental atmospheres. As well as SoundScaper there is also a Flanger swappable for a filter, and a delay. The effects can be routed in 3 different ways, SoundScaper->Flanger->Delay, Flanger->SoundScaper->Delay or in parallel. 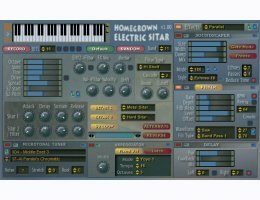 As with other Homegrown Synths, Sitar features a versatile Scala based Microtuner and comes with a standard selection of 300 patches. There are over 3,500 patches freely available from the Scala website which can also be used. Finally there is also a fully featured Arpeggiator and an inbuilt Recorder capable of recording WAVs directly to disk at up to 32-bit. As an added bonus there are also 500 24-bit Electric Sitar Loops with RX2 equivalents. There is a demo version available which has just a single lofi sample set and no Microtuner. 2 ADSR Envelopes - Simple Envelopes. Envelope 2 can either be used to control Sitar 2 volume or used to shape the Filter Cutoff Frequency.